Ethan Wate thought he was getting used to the strange impossible events happening in Gatlin, his small town. But now that Ethan and Lena have returned home from the Great Barrier, strange and impossible have taken on a new meaning. Swarms of locusts, record breaking heat, and devastating storms rage through Gatlin as Ethan and Lena struggle to understand the impact of Lena’s claiming. Even Lena’s family of powerful Supernaturals is affected – and their abilities begin to dangerously misfire. As time passes, one question becomes clear; what – or who – will need to be sacrificed to save Gatlin? Sometimes there is no going back. And this time there wont be a happy ending. Beautiful Chaos is the third book in the Beautiful Creatures series. At the end of Beautiful Darkness (book 2), Lena finally claimed herself as a Caster for both light and dark, ultimately ruining her evil mother Sarafine, and evil great- great-Grandfather Abraham’s, plans for her! Since Lena’s choice is unprecedented in Castor history, it seems to have upset the order of things. The result is major chaos in the small town of Gatlin, not to mention in the Caster world! To add to this dilemma, Ethan has started to feel strange and not exactly like himself. He has begun to notice significant changes in his personality, forgetting simple things like his phone number and even his own memories! More disturbing are his constant nightmares, where he always dies at the hands of someone that looks exactly like him! I must say I enjoyed this book much more than I did Beautiful Darkness, and I am still completely hooked on this story! The connection and love between Lena and Ethan was back on track, and I found I really started to enjoy Lena’s character again! I like that this book was generally more action packed than Beautiful Darkness. The drama between Abraham/Sarafine and Ethan was intense, exciting and definitely kept me intrigued throughout the book! I also love the additional characters and what they bring to the story. Ridley, Lena’s dark Caster cousin, who has been in the story since the beginning – is one of my favourites at the moment. I also really enjoyed the connection that Lena had with Ethan’s best friend Link! Thankfully, the love “square” that was formed in Beautiful Darkness seems to be over with, which I found made me appreciate Liv and John’s characters a lot more – they are so cute and I hope it works out for them in the end! The end of this book will definitely leave you with this horrible feeling of suspense and sadness, so much so, that you will just want to rush to read the fourth and final book -Beautiful Redemption! Check out my other reviews to this series, Beautiful Creatures (Book 1) and Beautiful Darkness (Book 2). One Night in the rain, Ethan Wate opened his eyes and fell in love with Lena Duchannes. His life would never be the same. Lena is a Caster and her family is locked in a supernatural civil war. On her sixteenth birthday Lena made a terrifying choice, which now haunts her day and night. As her seventeenth birthday approaches, Lena and Ethan face even greater danger. A Caster and a mortal can never truly be together. 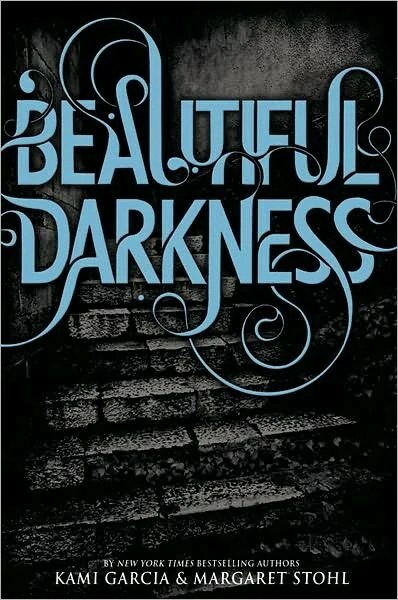 Beautiful Darkness is the second book in the Beautiful Creatures series. The book begins with Uncle Macon’s funeral – who unfortunately died at the end of book one. Since his death Lena, who is feeling completely riddled with guilt, begins to pull away from Ethan and starts to spend a lot more time with her dark Caster cousin, Ridley, and her new mysterious friend, John Breed. In the meantime, Ethan is dealing with supernatural issues of his own (even though he is mortal) and is struggling greatly with the fact that he has no Lena to confide in. I am really enjoying this story right now! Beautiful Darkness is the second book in the Beautiful Creatures series, and I am absolutely hooked! In saying this, however, I did find this book slightly disappointing. For starters, the love story was completely off track. I found Lena’s character to be extremely frustrating, and quite frankly, I didn’t really like her at all! She was so annoying that at times I felt like I just wanted to pull her out of the book and shake her until she saw sense! Aside from that, I still really love Ethan’s character and, in my opinion, he is the strongest of them all! He put up with and went through quite a lot in this book (especially with Lena), yet he refuses to give up or let her go no matter what the cost! Then there are two new characters, Liv and John. John is basically the character that you will love to hate! With Liv’s character I found I had mixed feelings. On the one hand she seems cute and very easy to get along with, but there were times when I didn’t appreciate the fact that she was obviously in love with Ethan in spite of the fact that she knew he was with Lena. Even though these two characters bring a new (slightly annoying) twist that adds to the love triangle (or square…whatever! ), I found they made a great addition to the story. I’m excited to find out where their characters will end up. All in all, I think it was a good sequel to Beautiful Creatures, and the last chapter definitely left an exciting opening for Book 3 – Beautiful Chaos! Slowly, she pulled the hood from her head…Green eyes, black hair. Lena and Ethan become bound together by a deep, powerful love. But Lena is cursed and, on her sixteenth birthday, her fate will be decided. Ethan never saw it coming. Beautiful Creatures is a modern tale of life in America’s South, highlighting that sometimes life is more than it seems. The story takes place in the fictional town of Gatlin, South Carolina. A proud and traditional town that takes seriously it’s peaches, its Civil War Re-enactments and its history. The story centres on the two main characters Ethan Wate and Lena Duchannes, and is told from Ethan’s perspective. Ethan is a sixteen year old local boy, whose mother died recently in a motor vehicle accident and whose father has since become a recluse. He is cared for, mainly, by his mystical and superstitious housekeeper Amma. Ethan is deeply entrenched in Gatlin history, as his ancestors were some of the founding fathers of the town. He is a star athlete on the basketball team, has a multitude of friends, but is becoming increasingly bored with the monotonous life of Gatlin. Lena is new to town. She moved in with the town outsider Macon Ravenwood, at Ravenwood Manor. The Manor is one of the oldest plantations in Gatlin and the Ravenwood’s have lived in the town since its formation. Lena finds it hard to fit in as, she isn’t a local, she wears the wrong clothes and she is not cheerleader material! Ethan and Lena meet at school. They realise they have been dreaming about each other for months. Going against what everyone wants him to do Ethan begins seeing Lena. It is then that he discovers that Lena is a Castor, a witch. She is awaiting her sixteenth birthday, as this is the day that Castor’s are either claimed for the Light, good witches, or the Dark, evil witches. The book was a little hard to get into at first. Once Lena’s true nature was revealed, and the paranormal secrets about her family and the town were discovered the book became far more engaging. The author’s descriptive writing helped to maintain interest and paint a clear picture of the characters, the town of Gatlin and the surrounding scenery. I found the use of Castor’s and witches in the story a refreshing take on the paranormal genre. The story was by no means predictable and it kept you guessing until the very last page. As it is series, it leaves quite a few loose ends, which makes you rush to get the next book. The book was very interesting, refreshing and unpredictable.